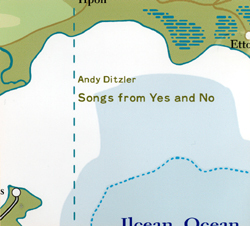 Press for "Songs From Yes and No"
"hip, intelligent, sometimes provocative, and often simply beautiful songwriting...Ditzler shows enormous promise on this album, and will bear watching in the future." "The songs are smart and funny"
"Ditzler has a nearly operatic grasp of storytelling through song"
"Ditzler majored in music, but he’s really a philosopher and a storyteller who happens to make interesting, quirky musical theatre." 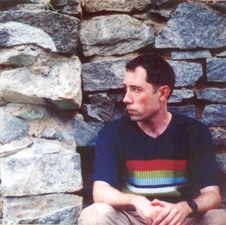 In his first CD, producer, arranger, composer and lyricist Andy Ditzler melds together myriad styles and influences. The melodic sense and production values of classic pop music; rhythmic influences from samba, jazz, rock and electronica; top-flight instrumental performances; and the tradition of 1970s and 80s performance art all combine to form an intricate musical mosaic. With a healthy sense of humor, the song lyrics range among technology, the metaphysics of TV news, a Buddhist samba, economics for beginners, politics, love, and citizenship in 21st-century America. Songs From Yes and No is a witty, poignant, and illuminating view of current events, and a provocative musical vision.